The Siberian breed has a long history. 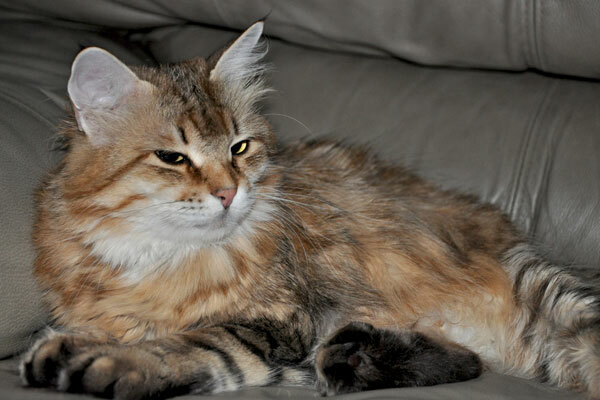 Siberian cats are commonly referred to as the natives of the great Siberian forests. This ancient breed of cats, co-existed along-side the pioneers of Siberia, lived with monks in isolated northern monasteries, and accompanied the natives of Siberia as pets and guarded their food from rodents and pests. This versatile breed of cats has adapted to the harsh, cold climate of Siberia, where the temperature barley rose above -40 in winter. This led to them developing 3-layered fur, which served as protection against the cold winds, and fur on the bottom of their paws, which helped them move along the frozen forests of Siberia. Existing in such harsh conditions has led them to developing their own unique appearance. Siberian cats look serious, proud, and even solemn at times, but while looking harsh on the outside, they are tender kind and loving on the inside. They are very patient, intelligent, playful, and can adapt to any household. If their owner is lonely, they will be nearby, have conversations, and patiently await attention if the owner is busy. If it's a noisy family with little children, they can adapt as well. They will play with children and forgive them, and will co-exist with and tolerate other pets. The Siberian breed has become very popular in the past decade, due to it being confirmed hypoallergenic, which makes them irreplaceable pets for people suffering from allergies. The saliva of Siberians contains very little Fel d1 proteins which, when in contact with fur, produces allergic reactions IgG or IgE. But keep in mind, that while they may be hypo-allergenic, that it does not mean that they are 100% allergy free. Many allergic owners who have had Siberians in their households, have not experienced any allergic reactions. This fact and their generous and loving nature, makes this ancient breed more and more popular in common households, as more people enjoy their kindness and affection.